Alpine history was written on the Eiger and Mammut is sure that the first ascenders of the north face would also have wished they had a lightweight insulating jacket. Whether you have set your sights on a first ascent or a repeat of a classic, on cold days in high mountain terrain, you should always take along a warm, lightweight insulating jacket that fits under a hard shell but is small enough to stow in your backpack. The Mammut Eigerjoch Advanced IN Hooded Jacket is an innovative and uncompromising down jacket with an outstanding warmth-to-weight ratio. 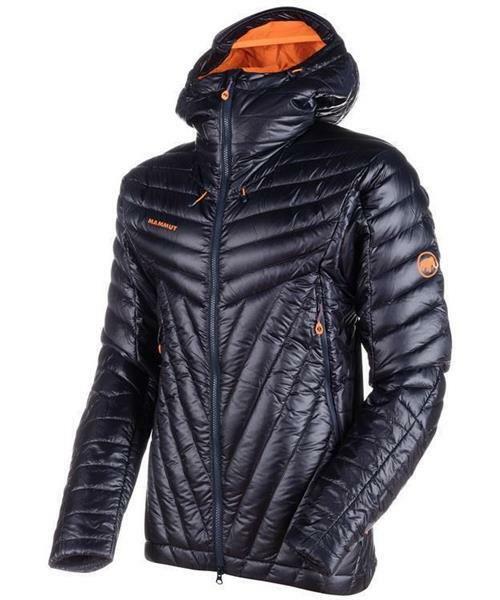 The torso area of the high-end jacket is filled with water-repellent 90/10 goose down with 850 cuin puff strength, sourced from animal-friendly operations. Under the arms and on the hood, PrimaLoft® Gold Active inserts with 4-way stretch ensure optimal moisture-wicking and freedom of movement - with or without a helmet. The outer material is the water-repellent and highly abrasion-proof Pertex® Quantum, to ensure the Eigerjoch survives even contact with rocks and your heavy backpack unscathed. The same revolutionary pattern as used for the Nordwand jackets ensures that the Eigerjoch IN Hooded Jacket sits perfectly when climbing or mountaineering. The pockets are accessible even when wearing a climbing harness and the elasticated cuffs stop cold air from penetrating. And if you take the Eigerjoch Advanced IN Hooded Jacket off, you can simply pack it up in the chest pocket.